For years, activists claimed the world was rapidly depleting its oil and natural gas supplies. The fracking revolution (horizontal drilling and hydraulic fracturing) obliterated that argument, by sending US oil and gas production to new heights. Indeed, record gas supplies and plummeting gas prices combined with the Obama EPA war on coal to shutter many coal-fired power plants. The prestigious journal Nature Geoscience recently published a careful study that found there has been far less planetary warming since 1998 than alarmist scientists and computer models had predicted. The models are based on the assumption that carbon dioxide drives climate change, and they “run too hot,” resulting in predictions that deviate from actual temperature measurements more and more every year. But instead of admitting they were wrong, the usual strident suspects in the climate crisis industry doubled down and attacked the study and any news outlet that called attention to it. Even Britain’s BBC denounced the inconvenient study and displayed not a whit of apology over its climate chaos claims. Climate campaigners jumped all over Hurricanes Harvey and Irma, insisting without an iota of evidence that they had been created or at least intensified by manmade greenhouse gases. They’re making the equally absurd claim that shutting down US and Canadian pipelines will somehow reduce atmospheric CO2 levels and prevent climate change and extreme weather – even though China already has 2,363 coal-fired power plants and is adding 1,171 more; India has 589 and is adding another 446; Indonesia and Vietnam are adding 140 to their fleet; and even Germany is burning more coal every year. Pipelines get conventional, fracking and oil sands oil and gas to markets: natural gas to homes and power plants, oil to refineries, oil and gas to petrochemical plants – and crude oil, refined products and liquefied natural gas to export terminals that send the energy to Mexico, Europe and Asia. If they can’t prevent companies from producing oil and gas, hydrocarbon haters want to prevent them from shipping it. However, the study is seriously outdated. It analyzed data from 2004 to 2012 – before the surge in US oil production … and before the monumental increase in rail transportation necessitated by protests and Obama Administration decisions that blocked construction of the Keystone and Dakota Access pipelines. In 2014, the USA set a new record for railroad tanker spills: 141 – versus an average of 24 during the years covered by the IEA report. Rail accidents in Colorado, Virginia, West Virginia and other states resulted in significant oil spills, evacuations and even serious explosions, but fortunately no deaths. However, a 2013 disaster in Lac-Megantic, Quebec burned 47 people to death and left many others seriously injured. The danger of moving oil on rails and highways through populated areas is clearly high. Environmentalists tend to focus on potential volumes of oil spilled when a major pipeline rupture occurs, and on impacts to waterways and wildlife. While these are vitally important considerations, human safety should be of paramount concern. A new technology transforms heavy crude oil into pill-sized pellets, self-sealing balls of bitumen that can then be moved in coal rail cars or transport trucks with less risk of spills. That may eventually reduce the need for new pipelines; but it is just now in the testing stage. Moreover, we cannot ship natural gas by tanker truck or rail car. Pipelines are essential for that. Even more important, some activists are now going far beyond mere rhetoric and protests – and engaging in sabotage of pipeline construction equipmentand even pipeline safety valves. These intolerable acts should be met with police action, major fines and jail terms. Free speech and peaceful protests are absolutely acceptable. Eco-terrorism and threats to public safety cannot be tolerated. These radical activists would never give up their reliance on – and addiction to – computers, smart phones, synthetic fiber shoes and clothing, affordable heating and air conditioning, cars, skis, kayaks, wind turbines and solar panels, and all the other blessings that petroleum brings us. They should not expect the rest of us to give them up, either. Especially for the phony reasons they cite. 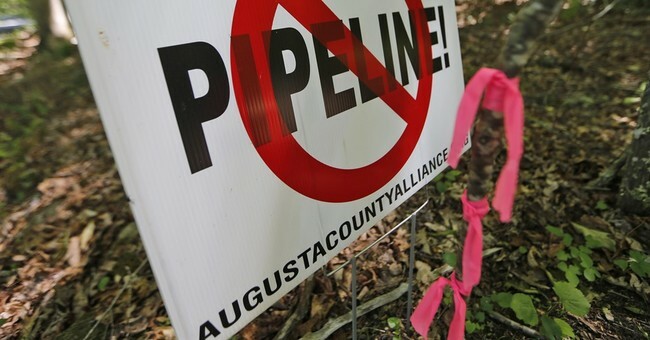 For all these reasons, it is hard to understand the increasing opposition to pipeline building by states and communities: from Minnesota to New York and even Virginia and West Virginia. It is even harder to understand or tolerate the actions of these tax-exempt anti-pipeline organizations – and the tax-exempt outfits that fund the radical groups: from the Rockefeller Brothers Fund to the Sea Change Foundation and its secretive Russian donors, and even to Warren Buffett’s NoVoFoundation. If an increasingly divided, partisan, dysfunctional Congress cannot address these problems, perhaps the Trump Administration and some state governors and legislators can do so.